Adobo……….The first time I had a taste of this dish was I think back in the Philippines, to be specific I think it was in Dampa sa Libis. It is a famous fresh seafood wet market where in you will buy fresh seafoods or meat and let you decide how it will be cooked. It is a clean, great and comfortable place to enjoy your food. It is like a big wet market with restaurants on its vicinity. 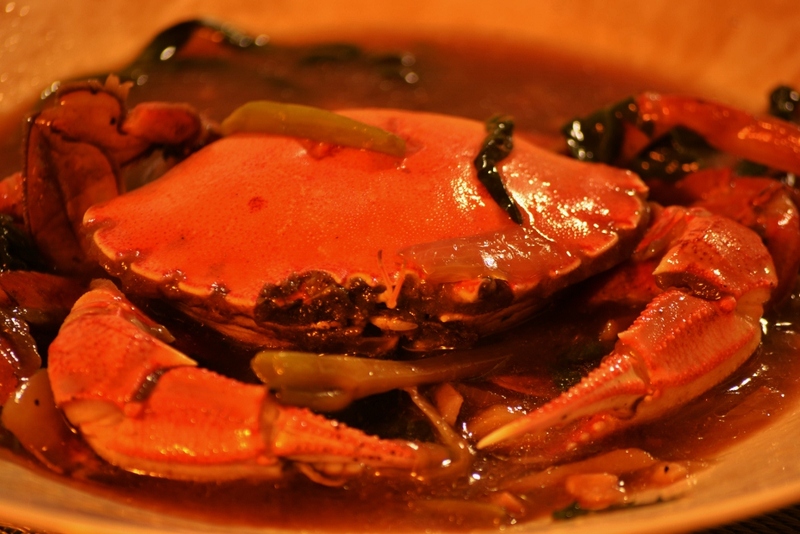 Now back to the dish, It is a crab cooked in our famous adobo way combined with ginger and kangkong……………………Did you know that crab is a good source of lean protein, which has high protein which is good for athletes or body builders who doesn’t want to eat fish. Crab are also a good source for chromium, which along with insulin helps in the metabolism of sugar maintaining the normal blood glucose levels. Also good for diabetic patients. ..
in a pan, heat oil and saute garlic, onions and ginger, add in crab and seasoned with salt & pepper and add the rest of the ingredients except kangkong and simmer for 3 minutes. add in kangkong and boil for another minute. Do not over cook crab as the fats melts. 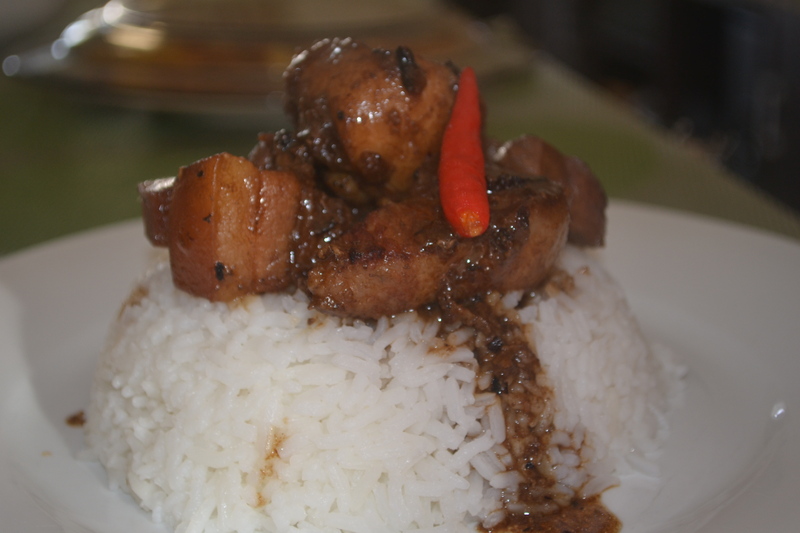 adobo……………Back in the Philippines, When we had a really tight budget and still want to eat a simple and great dish. We go for this dish. Just imagine a bundle of kangkong leaves( swamp cabbage or river spinach) is only priced at P5.00 or equivalent to 0.15 cents NZD you will have a health green leafy dish. Its a dish just flavoured with ingredients thats always present in our cup board, these are garlic, onion, soy sauce and salt and pepper. I think every kitchen has these type of ingredients……………………. 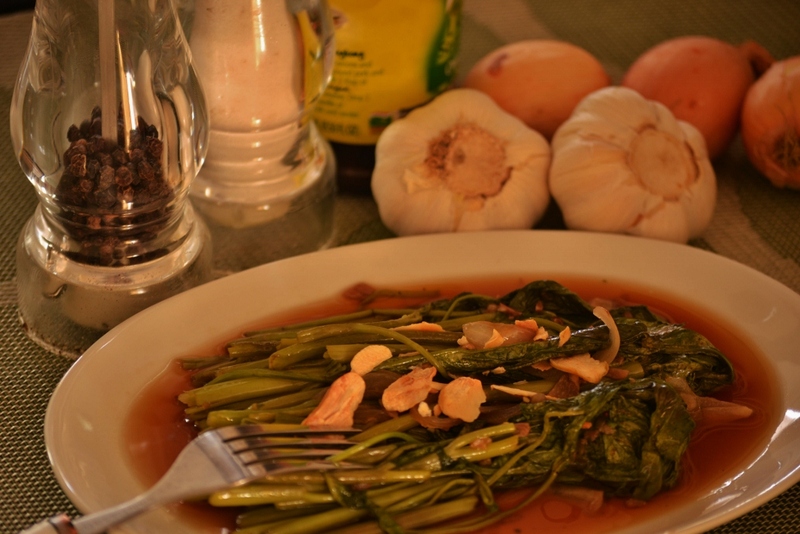 Did you know that kangkong or river spinach. This plant is rich in iron, calcium, phosphorus, carotene, sitosterol, protein, vitamins A, B1 and C and has a lot of health beneficial amino acids. Other pharmacological effects includes antitoxin, laxative, anti-inflammatory, diuretic, homeostatic and sedatives (sleeping effects). Water or river spinach has a good effect in the intestines as it has purgative properties because of its fiber content. It also acts as insulin-like properties to control blood sugar for diabetes prevention. in a pan, heat oil and saute garlic and onions, add in kangkong seasoned with salt & pepper and add the rest of the ingredients and simmer for 1 minute. 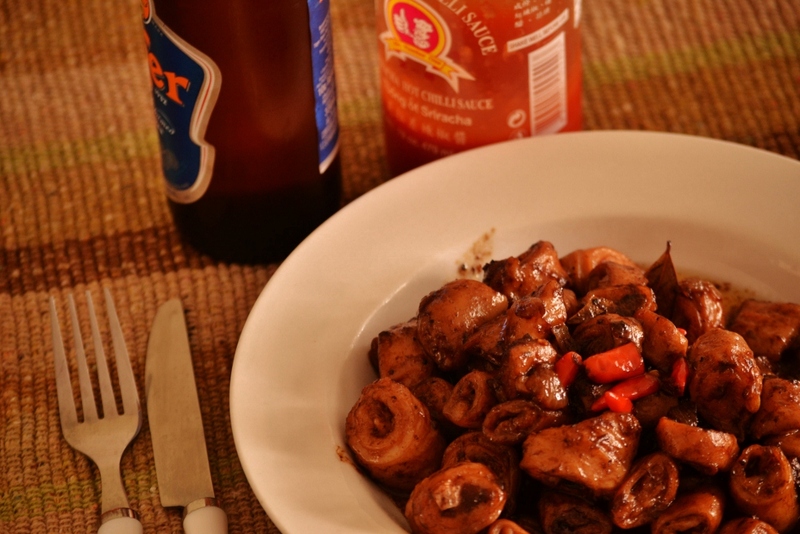 Have you tried eating pig intestine? On my back ground is a bottle of beer, Yes I am a beer drinker. i love to drink beer especially when this kind of appetizer is in my table. I remember during my teenage life preferably at the age of 14-17, I am a heavy drinker. I started early because usually I am a alcohol runner in our town. Meaning I buy beers on my “old fellows” and in return I get a free drink and appetizer. I grew up in a place where every day after playing a basketball game specially if we win that game, we always have a mini celebration. We buy beer and mix with gin and since there is a mini cafe serving best appetizer such as sisig and this one. It is super spicy adobo style pork isaw (tero tero). Well adobo is very famous especially when cooking exotic food such as intestines, lizards, snakes, frogs and many more. Have you try exotic dishes?……………………Did you know that the main ingredients to make this dish or all adobo flavorful is soy sauce. Soy sauce is rich in sodium content, which can act as a substitute for salt in your food. You can have a small amount of soy sauce to fill in for the salt content. Some varieties of soy sauce have relatively less sodium content. You can use them instead of adding too much salt in your food. Soy sauce blends well with all the spices, to give a great flavor. Soy sauce also has good amount of niacin, protein and manganese, which are necessary components for good health. Boil pork tero tero in a medium sauce pan with 1 liter of water for 15 minutes. Drain and slice into 1/2 inch or bite size portion. set aside. pour in the rest of the ingredients and adjust your taste by adding fish sauce . cook until sauce is thickened. This is my version of humba (sweet adobo)……..Humba, Adobong Bisaya is very popular dish in Visayas and Mindanao (the big regions in the PHI), some places they call it adobong Bisaya. Humba or adobong bisaya is basically cooked same way with adobo, it is a bit salty and sometimes sweetened with panocha or brown sugar but not too sweet compared to the Tagalog version. Because in early times, most residents does not have a fridge to keep their cooked meal, this dish has to be cooked dry and oily, to keep the shelf life longer without refrigeration. So to summarize, the flavor is mixed with salty, sour, sweet and spicy……………..Did you know that the sugar I used to make this recipe sweet is brown sugar? and raw brown sugar contains slightly fewer calories compared to refined white sugar, therefore is more effective in preventing obesity. Some studies states that raw and brown sugar contains some of the natural minerals that are maintained during the process of refining sugar that prevent growths and abnormalities. …. Add vinegar, soy sauce, garlic, bay leaves, sugar, salt, peppercorn and water. When the juice is absorbed just another 1/4 cup of water. 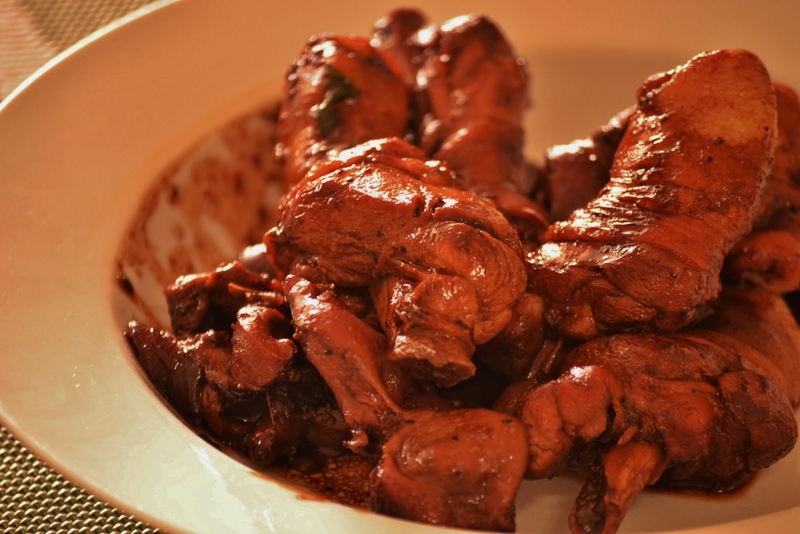 Adobo…a very popular dish in the philippines. 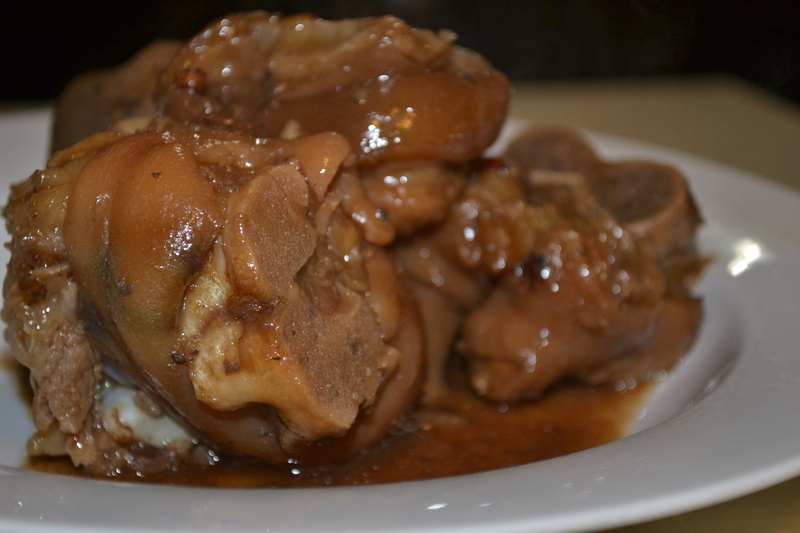 Almost all ingredients can be cooked using the famous adobo style – be it meat or vegetables. To name some you can cook Chicken Adobo, Pork Adobo, Adobong Kambing, and Adobong Pusit and even adobong gulay such as sitaw and many more…. Did you know that Pork meats are ideal to every kinds of cooking like barbecuing, frying, stewing and many others. Although rich in these vitamins and minerals, better enjoy pork dishes moderately to avoid heath problems in the future. There are different types of cooking and procedures of adobo. some usually saute’ it…butfor me, I will be using the “sinangkutya: method. (slow cook until meat is tender). In a large sauce pan, mix all ingredients together, bring to a boil for about 30 minutes or until sauce is thickened and meat is tender. add 2 tbsp cooking oil and stir fry… serve hot. Did you know that Pork is the number one dietary source of thiamin and it offers an impressive amount of vitamin B as well. Pork is naturally low in salt and a rich source of good quality protein…But too much eating of pork especially its fat can lead to some serious health problems. When the juice is absorbed just another cup of water.